Jeff Bowman lives a normal life… for a kid living in a mile-wide thousands of stories tall ‘arcology’ in a world where there are colonies beyond earth. Jeff, his friends Harriet and Akio, and a growing network of their friends have found a way to make extra money for school, lessons, and programs for their datapads. They rebuilt robots to help garden, because everybody eats synthpaste and real fruits and veggies are valued highly. Their friendship is disrupted when they are separated by colonization, and Jeff begins his true path, following in the footsteps of his father as an engineer on a Spaceship. 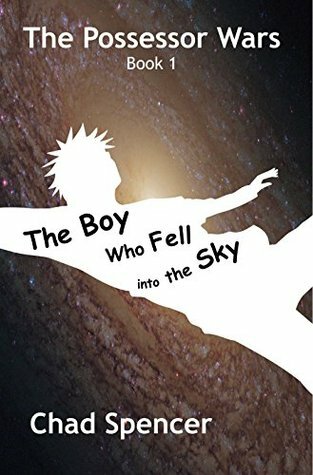 The immediate opening of The Boy Who Fell Into the Sky is full of catchups, aka backstory. The reader is inundated with current technology and sci-fi knowledge of how space travel works. The author spends a lot of his first few pages defining all the new aspects of technology, which intrudes into the developing story and drags out the explanations that most readers of young adult will skip over entirely for the good stuff: the story and the action. The author even employs textbooks to help him tell the story of this modern society, dulling the impact of the crazy wonder of a new world by straight out telling the reader all about it instead of letting it soak in naturally from events, dialogue, etc. I was intrigued by synthpaste, the concept of every food (flavor) from one tube. I was also quite intrigued when Jeff and his friends subverted this concept of fake food by growing a garden (illegally), but the author didn’t take this action anywhere. The gardens were a plot dead end and only showed the reader that Jeff was a nice guy and took care of his friends, which he continues to do throughout book, rendering the entire first part of the book unnecessary. About a third of the way into the book, the author threw in a bright yellow wrench of surprise that blew me away. O cruel, cruel writers to give your characters their worst nightmares and have them struggle along, attempting to be the heroes and heroines of their own stories. What a grand plot twist. Hissing and booing, I cringed when I came to this line: “Did it ever occur to you that girls like to do different things than guys?” First the author makes the one girl fit in as one of the guys, calling her Harry and then we find out she never wanted to be called by that name. Then the author gives her such a weak personality that is so stereotypically girly that I just want to tear the pages out. The other females introduced later are no better and none would pass the infamous Bechdel test (a work of fiction featuring at least two women who talk to each other about something other than a man). Granted, the female characters are not that bad, but when Harriet tells Jeff and the guys that she wants to be treated as a GIRL because she is a GIRL, I take offense as a GIRL. Surely this novel was not just written to be read by young male readers? Supposedly these three friends are approximately 14-years old. To me, their behavior and speech pegs them at a middle school age, not at a high school age. Their inappropriate behavior and near tantrums give the impression that they are younger and that the novel is intended for a younger audience. The stylistic choice for capturing Jeff’s thoughts became annoying and intrusive to read. I understand the novel was written in third person from the point of view of Jeff (most of the time), but to tell the reader “Jeff thought” every time Jeff has internal dialogue was repetitive and annoying. I wish the author had thought to place Jeff’s inner-thoughts in italics or did away with them altogether. Were all of them truly necessary? Probably not. I did really enjoy the concept of referencing others by Sirsen and Mamsen for Sir and Miss/Mrs./Ms. respectively. One of the biggest issues in this novel was the pointlessness of the first part of the book. What is the essence of the story if not about Jeff’s great problem in space and the first part was a buildup to nowhere with Jeff and his three friends. Understanding that this book is a part of a series might come into play later on in the series, but looking at this novel as a unit in and of itself, it come up lacking in this regard. I recommend this book for anyone who enjoys early reader young adult novels or futuristic space stories. This novel was published by PossessorWars.com July 22, 2014 and is available on Amazon here.